This is a blueberry cake with blueberry cream cheese icing. If you love blueberries, this cake is for you. You can stop by Slight Indulgence to pick up a cake. This is my first attempt at an Irish Whiskey Cake. I think they look really good and taste pretty good. They turned out to be a bit dense but not a complete disaster. These muffins are currently at the co-op. You can also find Chocolate Cherry Cookies, Peanut & Chocolate Chip Granola Bars and Oatmeal Raisin Cookies. There are a few goodies to check out at the co-op right now. The chocolate version of the cream filled cakes are so good. Other items available are chocolate cherry cookies, coconut & date granola bars and orange chocolate chip scones. Carrot Cakes are available at Slight Indulgence this week. Freshly baked Chocolate Chip Cookies are available at the co-op. They also have Fruit & Nut Granola Bars, Cherry Coconut Muffins and a few lonely heart cakes left from Valentines Day. I made a bunch of these cakes for Slight Indulgence. Chocolate cake with a rasberry treat hidden inside and covered with chocolate ganache. There are a few of these cakes left at the co-op. Stop in if you have a sweetie or a sweet tooth. An Oatmeal Cookie with cranberries in place of the raisins. You can stop by the co-op to get one. They also have Fruit & Nut Granola Bars, Chocolate Chip Ginger Muffins and Peanut Butter Cookies. I've been baking a lot of small cakes lately. These are chocolate cake covered with peanut butter ganache that is covered with chocolate ganache. They are rich, decadent and available at the co-op. 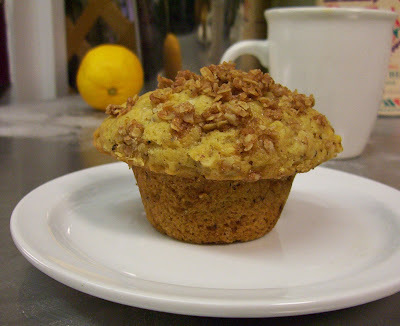 You can also find Cherry Lemon Muffins, Peanut Butter Cookies and Coconut Date Granola Bars. Stop by Slight Indulgence for your own mini chocolate cake. Stop by the co-opif you want to try one of these Peanut Chocolate Chip Granola bars or one of these little cakes. These are a test batch of Blueberry cakes that were a request from Slight Indulgence. They turned out decent but not quite right. One more test batch with a few changes and they were great. The final cakes were covered with Lemon Cream Cheese Icing and have been delivered.